When Hayley started with St. Anthony School Programs in Kindergarten nearly ten years ago, loud noises frightened her and she was very shy. 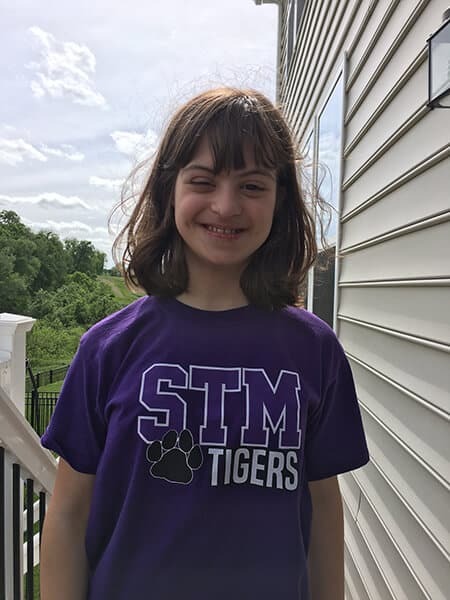 Now, as an eighth grade student at St. Thomas More, Hayley has participated in the school’s talent show and even sang the National Anthem at this year’s St. Anthony Inclusive Games. When it was time for Hayley to head to kindergarten, sending her to St. Thomas More in the St. Anthony program was an easy decision for Mindy and her husband Kevin. The family values Catholic education and knew this would be the best fit for their daughter. At school, Hayley has many friends. Her classmates take her under their wings and support her, helping her succeed. “Hayley has really matured over the course of her education, but the support she has received is amazing. It has given her confidence,” Mindy remarked. Next year, Hayley will start high school at Bishop Canevin. When asked if she was ready for the next step in her education with St. Anthony School Programs, Hayley nodded excitedly. Mindy and Kevin are even looking beyond high school for Hayley, with plans to enroll her in St. Anthony’s Duquesne University program. The girl who started school as shy and crowd sensitive, now strolls into a conversation with a complete stranger with excitement and confidence. And when asked about singing, she truly lights up. “We never thought we’d see her in front of a crowd like that – the support from St. Anthony is amazing,” Mindy said.